As winter blossoms into spring, so does the shifting fashion season. Despite my urge to substitute my current wardrobe for a closet of fresh clothes when this time rolls around each year, I have found a similar sense of novelty in recycling pieces I already own. In the spirit of new beginnings, I have provided a few ways to revamp your denim without breaking the bank on a trendy new pair of jeans. Dip dying is very on-trend this season and is an easy and fun way to breathe new life into your denim. 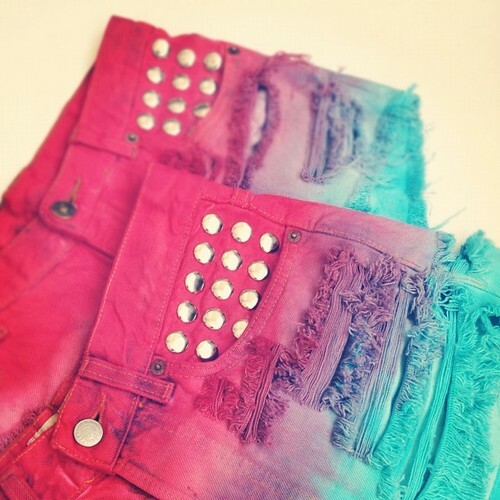 By repeatedly dipping your jeans in the dye, you can control the color saturation to achieve a gradual ombre effect. Dyes are available at most craft stores, and the color is up to you! You can even use bleach for a brighter, beachy vibe. I am obsessed with anything studded and love the contrast between severe studs and a muted wash of denim. Jazz up your jeans by studding the back pockets, belt loops, or even the pant legs. Go crazy! You can probably purchase studs at your local craft store, but I just bought some on Etsy for less than $4. While distressed denim often evokes images of those shabby Abercrombie jeans you wore in eighth grade, you can fray your own jeans to keep the look updated and chic. Use a razor blade to make slits along the thighs and throw them in the washer and dryer to complete the process. Rubbing sandpaper along the legs is another way to DIY your denim distress so that it looks like you’ve been breaking them in for years. With the current craze of tribal trends and colorful patterns, painting your denim is a great way to add some style to your jeans or shorts. Using fabric paint, you can color block, create intricate patterns, or get wild with colors by using your brush to splatter paint. A classic take on denim renovation: turning your jeans into cutoff shorts is the perfect DIY project for the approaching summer. Make sure to choose jeans that are already a little baggy, and overestimate the length of the shorts. Remember, you can always cut more, but there’s no turning back once you’ve snipped too much!